Matching up with the ever increasing requirements of the customers, we are engaged in providing Tiger Eye Fancy Necklace. Description : This uniquely designed necklace is prepared out of Blue Tiger Eye and Dyed Blue Crystal Agate and is presented before you from Pearlz Ocean. The necklace is 18 inches in length and is secured with a silver tone metal round ring T clasp. 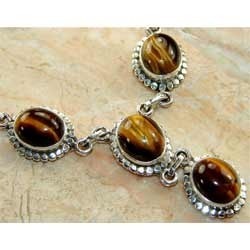 Being the leading names in the industry we are involved in offering a wide range of Orignal Tiger Eye Necklace. 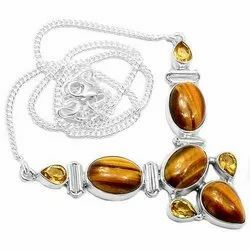 Offered Tiger Eye Necklaces are highly reckoned among our clients due to their various attributes such as reliability, fine finish, attractive looks and many more. Additionally, these are available in market in variety of patterns at very economical prices.